How insulting is it for the Mayor of Cleveland to attack citizens for depression, when that is caused by HIS lead poisoning? Submitted by Norm Roulet on Thu, 02/24/2011 - 17:26. Mayor Jackson has been reported to believe the problems with Clevelanders and so his Great City are all in our heads - we're depressed and have a bad attitude... get over it. In response, Cleveland leaders have initiated a variety of "don't worry be happy" "Believe in Cleveland" programs, like their latest "Happiness Virus" initiative by a group of consultants associated with the Cleveland Clinic leadership. Unfortunately, MEDICAL SCIENCE finds this ridiculous outlook and strategy ignores the cause of citizens' very real depression here - lead poisoning. The real science of the Archives of General Psychiatry "looked at 1,987 adults ages 20 through 39, finding that those with the highest blood lead levels were more than twice as likely to suffer a major depressive disorder and nearly five times as likely to suffer from panic disorders as those without elevated blood lead levels. The study is a rare look at how lead exposure can affect adults, as most research to date has been focused on the side effects of lead on children." Submitted by Norm Roulet on Thu, 02/24/2011 - 14:09. Rapidly warming climate is likely to seriously alter crop yields in the tropics and subtropics by the end of this century and, without adaptation, will leave half the world’s population facing serious food shortages, new research shows…. Yes, this 2009 study is a serious underestimate of the speed and scale of likely impacts for two reasons. Submitted by Norm Roulet on Thu, 02/24/2011 - 11:30. Shock and Awe: House votes to eviscerate 40 years of bipartisan environmental safeguards. Fight moves to the Senate next week. Please email your Senators today urging them to reject the polluter assault on our clean air and climate future. You're going to breathe dangerous air, drink dirty water, be exposed to toxic pollution… And you're going to like it. Oh, and you can forget about a safer climate future. Submitted by Norm Roulet on Thu, 02/24/2011 - 02:58. February 22, 2011, President Obama and senior staff visited Cleveland - joined by Department of Energy Secretary Steven Chu - to discuss how the Federal government may help small business grow... including in the energy sector. As an example of what small business owners may expect as next steps, you should subscribe to relevant U.S. government mailing lists like for the US Department of Energy Business Opportunity Sessions (BOS) - see link below. If you own a Women-Owned Small Businesses (WOSB) interested in energy, and government support, the following message is FOR YOU! This should be an exciting session and opportunity. As you'll see, if you are a Small Disadvantaged Business, HUBZone;8(a), or Service-Disabled Veteran Owned small business, the DOE has specific Energy Business Opportunity Sessions (BOS) for you as well - subscribe for updates and good luck! Submitted by Norm Roulet on Tue, 02/22/2011 - 14:14. Posted by Bill McKibben	at 9:58am, February 22, 2011. Consider it a tale of two speeches and a grim parable for our American moment. On March 24, 2010, Treasury Department Deputy Secretary Neil Wolin arrived for his lunchtime speaking slot at the U.S. Chamber of Commerce's impressive headquarters, a short walk from the Treasury building and the White House. When his time came, Wolin strode onstage and, before hundreds of its members, tore into the chamber and its policies. As an organization, it was dishonest and "backward," he said. An ongoing three-million-dollar lobbying campaign was not intended to bolster badly needed financial reforms on Wall Street, as claimed, but "designed to defeat them." 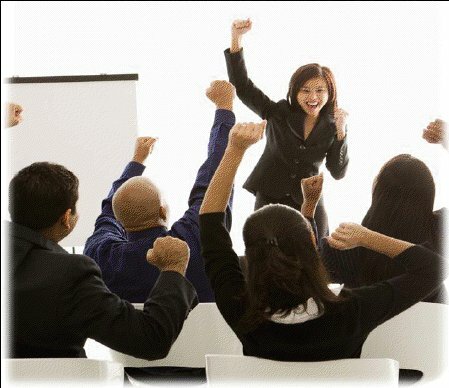 A stunned audience mustered only the weakest of applause. At the time, there was no love lost between the White House and the chamber. Later that fall, with the help of a crucial Supreme Court decision, the group would act on that animosity, spending a staggering $33 million in the 2010 midterms and ushering in the biggest Republican landslide in generations. The toughest the president got was when he pled with the chamber's corporate membership to "get in the game" and use trillions of dollars of reserves piled up in the worst of times for American workers to create much-needed jobs. Submitted by Norm Roulet on Tue, 02/22/2011 - 12:56. Submitted by Norm Roulet on Tue, 02/22/2011 - 12:30. Thank you for coming to Cleveland to bring attention to environmental injustice in Northeast Ohio. I assume EPA Administrator Lisa Jackson has briefed you that, in addition to being the most lead poisoned big city in America, we are one of the most polluted, unhealthy, and so undereducated places on Earth. As you ride into Downtown Cleveland - the most lead poisoned big city in America (the world?) - you pass one of the most environmentally unjust industrial facilities in America - Arcelor Mittal's Cleveland Works steel production and processing superfund site (AKA the Cuyahoga River Valley) - and, as you meet with Ohio taxpayer-funded business development agents here, you sit in the shadows of the privately-polluting Cleveland Thermal district coal plant (owned by some shadow out-of-state investors, it appears) immediately downtown... providing excessively polluting heat to the very Wolstein Center where you shall hold your small business conference today... "Cleveland Thermal’s largest customer is Cleveland State University (CSU)" (and they don't care). Don't breathe too deeply here. EPA Administrator Jackson and Department of Energy Director Chu may certainly tell you there are better ways to make steel and warm citizens, business development agents and the President of the United States of America than burning coal within 100s of yards of homes, offices and you. Submitted by Norm Roulet on Tue, 02/22/2011 - 10:08. 1Department of Biochemistry and Molecular Biology I, School of Biology, Complutense University, Madrid, Spain. 2Centro de Investigación Biomédica en Red sobre Enfermedades Neurodegenerativas (CIBERNED), Madrid, Spain. 33D Lab (Development, Differentiation, and Degeneration), Department of Cellular and Molecular Physiopathology, Centro de Investigaciones Biológicas, Consejo Superior de Investigaciones Científicas (CSIC), Madrid, Spain. 4INSERM U624, Campus de Luminy, Marseille, France. 5National Institute for Infectious Diseases, IRCCS “L. Spallanzani,” Rome, Italy. 6Laboratory of Molecular Neuroembryology, IRCCS Fondazione Santa Lucia and Department of Biology, University of Rome “Tor Vergata,” Rome, Italy. 7Cancer Genetics Program, Beth Israel Deaconess Cancer Center and Department of Medicine, Beth Israel Deaconess Medical Center, Harvard Medical School, Boston, Massachusetts, USA. 8Department of Neurosurgery, University Hospital, Tenerife, Spain. Address correspondence to: Guillermo Velasco, Department of Biochemistry and Molecular Biology I, School of Biology, Complutense University, c/ José Antonio Novais s/n, 28040 Madrid, Spain. Phone: 34-913944668; Fax: 34-913944672; E-mail: gvd [at] bbm1 [dot] ucm [dot] es. Received for publication November 3, 2008, and accepted in revised form February 11, 2009. Submitted by Norm Roulet on Mon, 02/21/2011 - 04:42. I've been stunned to find there is a movement in Cleveland, much like "Creationism" and psycho-conservative mind-control programs of the Koch Tea Partiers, called "Teaching Cleveland", that proposes a group of journalists from the Cleveland Plain Dealer (mostly now out-of-the-profession) and other amateur-historians are qualified to develop education programming for our children. From "Teaching Cleveland": "The Teaching Cleveland Foundation is a pending 501 (3) (c) organization with a stated mission to develop Cleveland-centered curricula in area schools that deepen an understanding of Greater Cleveland’s rich history, foster an appreciation of its varied resources, and equip participants with the skills and capacities to connect, collaborate, and commit. The future of Greater Cleveland depends on inspiring enthusiasm and a stronger sense and love of place to grow another generation of civic leaders." Wrong - the Future of Greater Cleveland depends on providing an authentic, safe, healthy, desirable place for people to live.... not brainwashing people to stay. Change "Cleveland" to "Fatherland" and you will realize the definition and concept for "Teaching Cleveland" is stolen from your typical fascist handbook... and this type of make-believe "story-telling" is defined as "Historical Revisionism" or "Negationism". Submitted by Norm Roulet on Sun, 02/20/2011 - 23:56. I'm pleased to see posted to the MCCO site that they are now committed to shutting down their coal boilers and will add no more. You should feel great satisfaction for this - 1,000,000s of lives will be bettered in very few years - and I appreciated your help accomplishing this. Submitted by Norm Roulet on Sun, 02/20/2011 - 21:20. While I believe we do a good job of keeping spammers from contaminating realNEO, we do not have a way we verify the identity of users and so may be exposed to "sockpuppets". But members of realNEO attack and kill them upon discovery. On the other hand, a poorly managed online world like Cleveland.com is certainly fully occupied by such evil forces. Now you may know, for a fact, those "people" you are interacting with, when you discuss important issues to you, on these poorly managed portals like of your monopoly newspaper in Cleveland... or that silly little Facebook of yours... are aliens from another universe. creating an army of sockpuppets, with sophisticated “persona management” software that allows a small team of only a few people to appear to be many, while keeping the personas from accidentally cross-contaminating each other. Submitted by Norm Roulet on Sat, 02/19/2011 - 23:50. The destruction of the world's forests is a major concern in our age. According to the UN about 40 percent of Central America's forests were destroyed between 1950 and 1980 and during the same period Africa lost about 23 percent of its forests. A whole range of environmental problems is associated with deforestation, among them severe flooding, accelerated loss of soil, encroaching deserts and declining soil productivity1. Sometimes we get the impression that these problems are unique to our time, but vast areas of surface of the earth were stripped of their tree cover well before the modern period. Today it is hard to believe that in antiquity vast forests were growing in the Middle East. However, during the early part of the third millennium BCE, the mountain slopes of this region were covered with massive cedar forests. These forests disappeared in the millennia before Christ's birth about two thousand years ago. The destruction of the cedar forests of the Middle East is told in the oldest know, surviving written story in the world: The epic of Gilgamesh. The epic was written in Mesopotamia sometime during in the 3rd millennium BCE. The second episode of the epic is known as “The forest Journey” and is the story of deforestation in the Middle East2. Submitted by Norm Roulet on Sat, 02/19/2011 - 19:24. At the start of this year, the U.S. Environmental Protection Agency (EPA) finally began using its authority to regulate greenhouse gas emissions under the Clean Air Act. Already, however, powerful forces in Congress--including some Democrats--are working to strip that authority away or delay its long-overdue implementation. We need to make sure Ohio Senator Sherrod Brown stands firm in defense of EPA's authority to cut greenhouse gas pollution right away. EPA authority to regulate greenhouse gases is the only tool we have right now at the national level to start combating climate change. Taking it away--or delaying it after all these years of inaction--is absolutely unacceptable. Mayor Jackson - This Is Your "Green" Legacy?!?! Submitted by Norm Roulet on Sat, 02/19/2011 - 06:08. 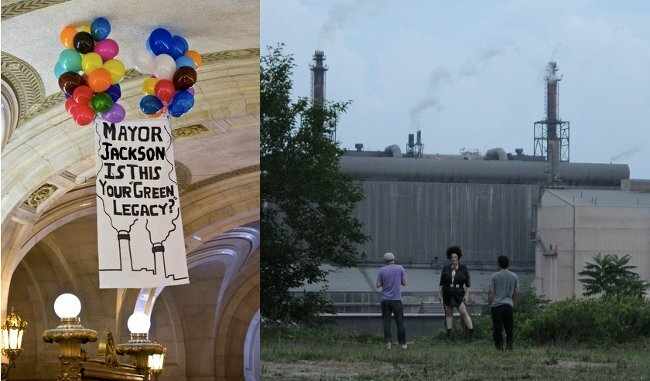 Balloon Over Coal-Fired Chicago: Mayor Daley, is This Your Green Legacy? Only days before Chicago voters launch their city into a new era with a new mayor, Chicago activists greeted departing Mayor Richard Daley in the City Hall atrium this morning with a giant balloon question mark on his self-proclaim “greenest city in America” legacy. Submitted by Norm Roulet on Fri, 02/18/2011 - 10:43. Regarding the fact that University Hospitals, of Cleveland, Ohio, gets its heat from a coal burning power plant on their urban campus - the Medical Center Company (MCCO), operated by US Senator Sherrod Brown's Brother - located in a largely poor, urban community, which has for over 70 years harmed the health of area and global citizens... and considering the fact no University Hospitals or other area physicians will publicly condemn this and such industrial practices in Northeast Ohio... I posted to realNEO: Doctors at University Hospitals Should Turn In Their Licenses to Practice Medicine, as Hypocrites. As they do not practice medicine ethically, all Doctors at University Hospitals Must Turn In Their Licenses to Practice Medicine - including my Father - as they do more harm than good as they pollute this community with soot from burning coal that is unnecessary and that causes certain harm and death to area citizens - especially the young, old, poor, black and weak... and these supposed "doctors" know that very well now. This lack of responsibility by physicians practicing "healthcare" in a geographic area with certain poor health from pollution - including unnecessary pollution from the doctors' own hospital - confirms findings of Alice Hamilton MD, in 1914... "There is here a great neglected field in American medicine and one of growing importance, for each year the number of industrial establishments which employ physicians increases, and the opportunity for expert hygienic control of our dangerous trades increases. But there will have to be a more general understanding of the problems of industrial hygiene before the service rendered by the majority of company physicians becomes of much real value." The Environmental History Timeline reports "Greek physician Hippocrates (460-377 BC), considered the father of medicine, notes the effect of food, of occupation, and especially of climate in causing disease. One of his books, De aëre, aquis et locis (Air, Waters and Places), is the earliest work on human ecology." This work, reproduced below, offers to all future physicians the guidance "when one comes into a city to which he is a stranger, he ought to consider its situation". The first observation of any physician coming into Cleveland - Stranger or otherwise - should be this is an unhealthy place due to excessive point source polluting from industry, including the MCCO power plant at University Hospitals. Submitted by Norm Roulet on Fri, 02/18/2011 - 09:30. As you read the following account of lead poisoning in America, you will come to realize physicians in America do not work for citizens, they work for corporations, and those corporations protect the interests of their owners, stockholders, and other corporations, rather than citizens, by using their physicians to hide from citizens the dangers of real environmental threats from industry, like lead poisoning. I brought this issue to the attention of realNEO readers with the publication of Perhaps the best way to eliminate bad climate science is to discredit bad lead poisoning scientists... starting with Dr. Schoen, and intend to provide the public with exhaustive ongoing analysis of this sad reality, harming all humanity. Alice Hamilton MD was smart enough to understand this... very few American physicians have followed in her footsteps... none in Northeast Ohio, that I know of, ever. But if you've got a lot of money, or good corporate insurance, some doctors here may be able to repair your broken, polluted heart. Submitted by Norm Roulet on Thu, 02/17/2011 - 05:27. The article included below - Energy Farming In America, by Lynn Osburn, from 1989 - really puts in perspective the evil of America's current energy portfolio and our global climate crisis, as it reports that on June 12, 1989, the first President Bush "recommended auto makers be required to make methanol-powered cars for use in nine urban areas plagued by air pollution - Bush called methanol "home-grown energy for America"." Reporting on this, in 1989, the author of Energy Farming In America forecast "Hemp is the only biomass resource capable of making America energy independent. Remember that in 10 years, by the year 2000, America will have exhausted 80% of her petroleum reserves. Will we then go to war with the Arabs for the privilege of driving our cars; will we stripmine our land for coal and poison the air we breathe to drive our autos an additional 100 years; will we raze our forests for our energy needs?" George Bush Sr. failed to act on his 1989 promise to move America off foreign oil, and his son took us to war against the Arabs "for the privilege of driving our cars" shortly after 2000 - under President Obama, we have a Middle East in melt-down, are expanding strip-mining of coal and poisoning of the air we breathe, are clearing our forests for biomass.... and we have punched a hole in the bottom of the ocean, spilled millions of gallons of oil, and discovered FRACKING to make the world even worse... as oil prices are at historic highs and NEVER COMING DOWN AGAIN... all in corrupt addiction to fossil fuels in global self-destruction. Submitted by Norm Roulet on Wed, 02/16/2011 - 19:20. President Obama called for more clean energy in his 2011 State of the Union Speech and continued his support in his new budget proposal. President Obama unveiled on February 14 a $29.5 billion budget request for DOE covering fiscal year (FY) 2012, including $3.2 billion for DOE's Office of Energy Efficiency and Renewable Energy (EERE). The budget request for EERE represents a 44% increase over the current FY 2010 appropriation of about $2.2 billion. The proposed budget aims to strengthen renewable energy sources, boost clean energy research, and cut expenses as the United States pursues the president's vision of generating 80% of its electricity from clean sources by 2035. Overall, the DOE budget would grow 12% over 2010 levels while cutting a number of programs and administrative costs. (FY 2010 numbers are used here for comparisons because Congress never passed an FY 2011 budget, and the federal government is running on a stopgap budget resolution reflecting 2010 levels). Submitted by Norm Roulet on Wed, 02/16/2011 - 17:57. 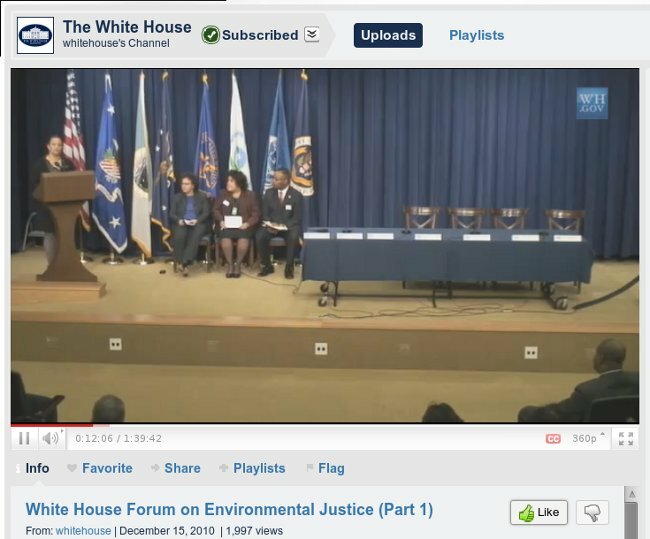 As I've reported on realNEO: "In what I consider the most important positive environmental development in America in the 21st Century, on December 15, 2010, EPA Administrator Lisa Jackson and White House Council on Environmental Quality Chair Nancy Sutley convened the First White House Environmental Justice Forum, where leadership of the recently-reconvened Federal Interagency Working Group on Environmental Justice (EJ IWG) met with over 100 environmental justice leaders (typically long-suffering EJ victims), in the South Court Auditorium of the Eisenhower Executive Office Building, at the White House complex, to develop new federal interagency strategies and interactions with citizens to right current EJ wrongs in America, in anticipation of worse to come as results of climate change." The next step in furthering the EPA's Plan EJ 2014 is a Quarterly Environmental Justice Community Outreach Call, which will take place on February 17, 2011 at 3 p.m. (Eastern Time). The purpose of these calls is to provide information to participants about the Agency's EJ activities and maintain an open dialogue with EJ advocates. As EPA continues to advance Plan EJ 2014, the Agency hopes that these calls will better inform the public about EPA's EJ work and enhance opportunities to take advantage of federal activities. See call-in information below. Submitted by Norm Roulet on Wed, 02/16/2011 - 17:28. Plan EJ 2014 is an overarching strategy intended to advance EPA Administrator Lisa P. Jackson’s priority to “expand the conversation on environmentalism and work for environmental justice.” Plan EJ 2014, named in recognition of the 20th anniversary of President Clinton’s issuance of Executive Order 12898, Federal Actions to Address Environmental Justice in Minority Populations and Low-Income Populations PDF (6 pp, 122K, about PDF), is a roadmap to help us integrate environmental justice into all of our programs. Over the next four years, we will implement the plan and work to strengthen our efforts to carry out the Administrator’s priority through continuous and meaningful engagement with communities and all stakeholders. Submitted by Norm Roulet on Wed, 02/16/2011 - 16:21.